When you are looking for some inspiration for your stitching, Instagram is a great place to look. You can connect with other embroidery artists, learn a few techniques, and get a sneak peek at what stitchers are working on. Of course, along with the inspiration, you'll also find community, so be sure to share your own work as you connect with and encourage these and other embroiderers. Once you start looking, you'll find so many people to follow. And as you see beautiful photos from these artists, you'll begin to think about new and different techniques to try in your embroidery! Lindsay of Tusk and Cardinal shares photos of her gorgeous embroidery, along with some glimpses of her life and other artistic pursuits. Her work is most commonly line art in white on black, as well as some subtle colors, making it simple and stunning. Jo is an embroidery artist based in the UK and her foliage and floral stitching is always inspiring. Even her use of color will get you ​wanting to thread your needle! In addition to her hoops, she also makes embroidered bags. Oh, and don't miss her monochrome florals stitched with yarn! Thread painting is an embroidery technique that is equivalent to painting a picture and using embroidery thread as the medium. And Chloe Amy Avery does that with a style that is so beautifully unique. Her embroideries (typically of foods) have an impressionistic quality, as the stitches take on the appearance of brushstrokes. But not only does she create large embroidered designs, Chloe also works in miniatures, stitching tiny designs that fit inside a bottle cap! This husband and wife team embroider custom house portraits and modern plants and landscapes. They've also started combining hand-painted background fabric with their embroidery, resulting in dimensional art with stitched texture. In the Thistle and Thread Design Instagram feed, you'll find plenty of embroidery, plus a lot of the inspiration behind their line of products. If you like florals and beautiful lettering, you will love the embroidery of Bug and Bean Stitching. Marley creates custom and ready-to-ship hoops. Seeing what she makes, her occasional process photos, and her wonderful color combinations will all inspire you. Liz of Cozy Blue designs delightfully whimsical embroidery patterns that come pre-printed on fabric. The patterns often feature creative use of lines, which means that even simple stitches result in fantastic texture. Her Instagram account is filled with designs in progress, new releases, occasional personal photos, and so much stitchy goodness! Cathy Eliot's embroidery is clearly inspired by nature. Her designs are both delicate and detailed, with a style that is classic without feeling stuffy. When you follow her, you may even find yourself wanting to get outside and do some nature journaling with thread! You may have seen Lolli and Grace before, and even been inspired by her felt and floral embroidery. Follow Anne on Instagram for even more colorful stitching. You'll see the patterns she's releasing as well as plenty of photos of the process she follows while creating her amazing work. Itty Bitty Bunnies is the Instagram feed of Sarah Buckley, who embroiders truly wonderful florals and landscapes. She works in hoops of different sizes and everything she makes is inspiring, but you'll especially be amazed by her miniature landscapes. Finally, if you want to see work from even more embroidery artists, follow the Embroidery Instaguild. 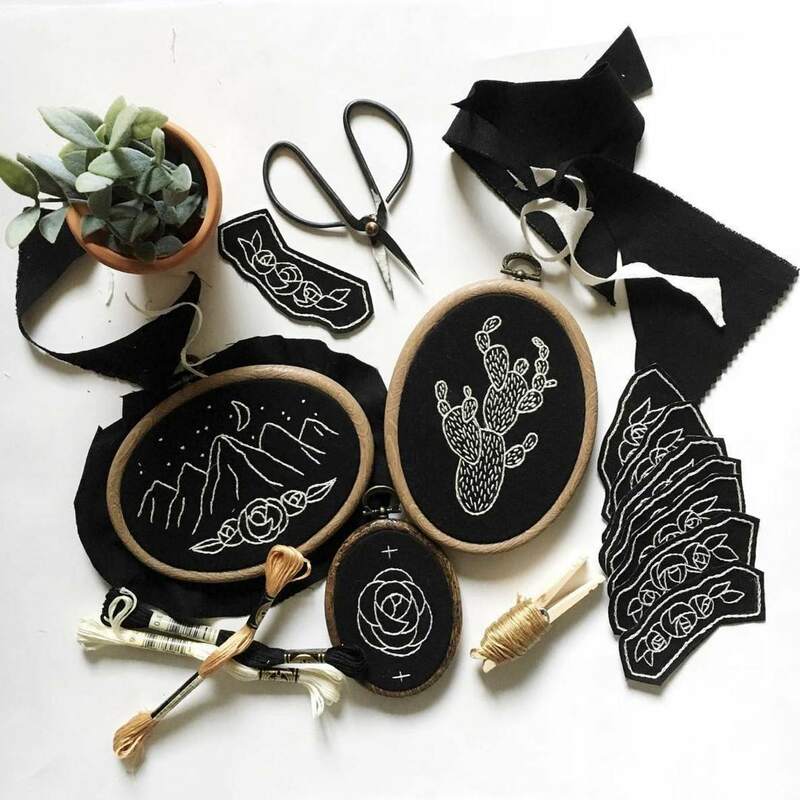 This account is devoted to connecting embroiderers and sharing their work, as well as becoming the online version of a local embroidery guild. They share images tagged #embroideryinstaguild, and that tag is a great place for you to meet fellow stitchers too!